Before we start, I'll put my hands up; I can't prove the statement in the headline of this post. We just don't have enough data. But with that out of the way, I'd like to try to persuade you that it's true. Whenever I look at a new or prospective client's generic search data, it invariably contains some big generic search terms for their market and also, inevitably, the cost per sale on those terms is way over target. I'm talking about search terms like "savings account", or "holidays", or "mortgages". The really obvious generic search terms for a market, with no qualifying words attached. This result has happened often enough now, that a pattern is starting to emerge. I think it's almost always true that the big generic search terms are overpriced. They are - by definition - unprofitable. I'd like to show you why I think that. Take the search for "European holidays" in the image above. It's a broad enough term that the chances of an individual clicking through and converting from it will be low and it's interesting to enough companies that there will be a lot of potential bidders in the auction. What's important here is that search ads are priced by the bids in an auction. A favourite tool of economists when they don't have enough data, is to assume away complications and then see what the world would be like if their assumptions about a market were true. The limitations of doing this are obvious (in that if your starting assumptions are wrong...) but it's still a useful exercise. In essence, a lot of the time what economists are doing is thought experiments, with maths. 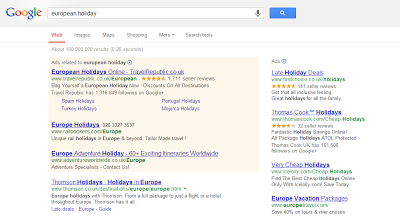 So what would the "European holidays" search auction look like if...? We've got a load of identical companies, who truly understand return on investment (ROI), all bidding for the same search term. Here's what would happen. One company bids for the term "European holidays" and starts to sell its product. Then a competitor bids a little more, because they can still generate a positive ROI, at a higher bid. Another competitor bids and the bids keep rising. The profit per sale keeps falling. Eventually one company bids high enough that they make exactly zero profit from running ads on that search term. And we stop. Everyone's got perfect information about ROI and nobody's going to bid high enough for the term "European holidays" that they start to lose money. In a market with perfect information and identical competing companies, nobody makes any profit from generic search, because if they do, somebody else will always bid the auction for that term up a little higher. Actually, it's worse than that. By owning generic search for now, a company might be able to drive its competitors bankrupt and then reduce bids in the future, once they've gone. Even in a market with perfect information, there's an incentive to bid up a search term's price until it is unprofitable. With me so far? Now let's break one of the core assumptions I listed above. We'll leave everybody in a market with competitors who are exactly the same as them, but take away their ability to measure return on investment. Some companies will underestimate their generic search ROI, some will get it right and some will overestimate it. The ones who overestimate ROI, will bid too much. 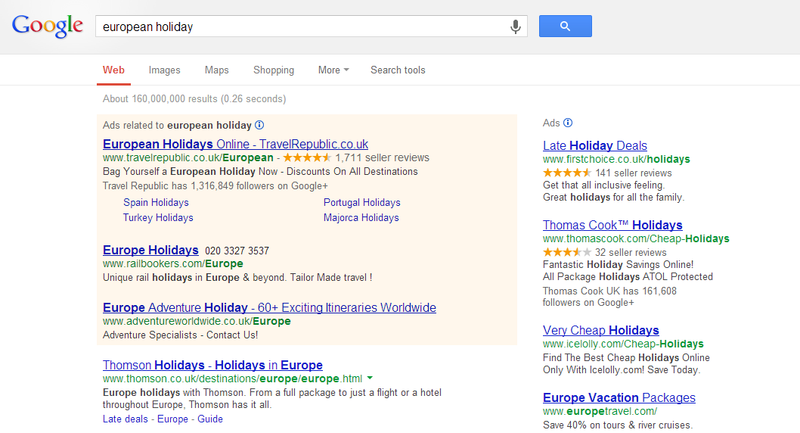 Maybe those companies think that generic search ads cause a lot of brand search - much more than is actually the case. Or they can't track customers all the way from clicks to sales and they wrongly guesstimate the link between the two. Whatever the reason, they overcook their bids because they can't measure ROI accurately. This means that even if you're a clever company, with perfect measurements of ROI, you can't bid profitably on the search term. You can't bid because there's another company, with a less capable marketing director, who's sent the auction price too high. Google doesn't just auction one paid search position, it sells a few, so you may be OK if you bid to rank lower in the list - it depends how many companies are overcooking their ROI estimates. One fool bidding means that the top spot has gone. Two or three and now you're just fighting over the smaller side-bar ads. It doesn't take much for bids on the whole search term to be overblown. As an economist working with search data, this is what I see; a market where imperfect information means auction bids on high volume generic terms are forced up to an unprofitable level in almost every sector. The only exceptions to this rule would come when we break some of the other assumptions that I listed above. You need a higher profit per sale than your competitors, or to have a better conversion rate, or a better quality score, to be able to profitably bid higher. This is why smaller generic terms often work well, because you bid on the ones that convert best for you - the ones that play to your company's strengths, where you have a better conversion rate than your competitors. But when you don't have a competitive advantage - when the search term is very general - we come back to a serious issue. Big generic search terms are inevitably unprofitable. Interesting post. I wonder if the companies bidding highest on big generic terms are the lowest spenders of ATL media/least known companies? Just thinking some of the pay off to overbid based on pure ROI (assuming sale) would come in the form of 'exposure' and not click - so role of generic search being used for awareness driving? A calculated hit maybe for expected low conversion? It's a fair argument, but not one that I'm sold on. You hear people arguing more and more often, that generic search ads build awareness as well as generating direct sales and it smacks of desperation to me... The direct ROI looks poor, so we scratch around for a new excuse why it might actually be ok.
Network Display's been through the same process already. If failed to generate clicks and direct conversions, so now it's an 'awareness building' medium. For me, if people see something on the internet that they're interested in, they click it. That's how the internet works! The only exception to that which I can reliably prove is for high quality video on demand pre-roll ads.